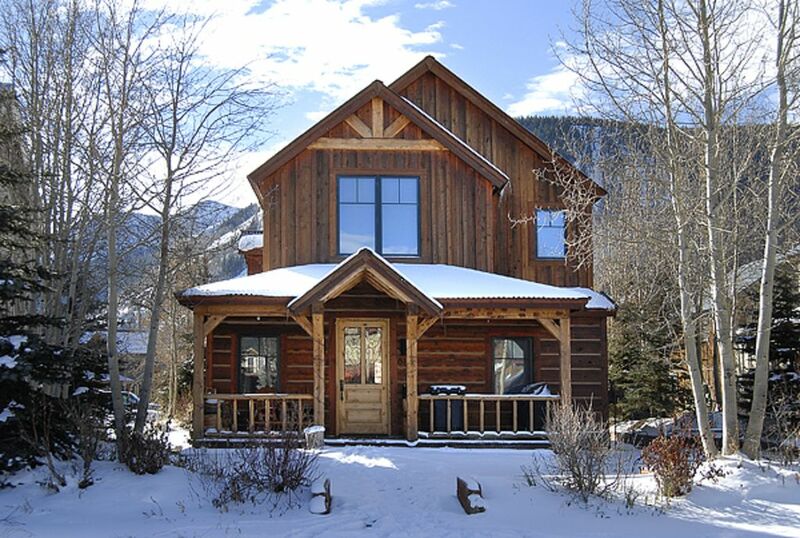 Originally built by one of Crested Butte’s top custom builders as his primary residence, this fantastic home will instantly transform you into the mountain experience. With large hand hewn beams, exterior chinking and custom covered porch, the rustic cabin feel is apparent before you even enter the home. Craftsman details at every corner, the Sopris House is a really unique getaway experience. Whether from inside the spacious home or outside on the private deck and yard, the sweeping views of Mt. Crested Butte and beyond will simply take your breath away! On the main floor a large entryway and 'mud room' closet provides ample room to gear up for the day and storage after returning from your adventure. Past the foyer is a guest bedroom with it's own bath and flat screen TV, and another separate powder room lies off the hallway complete with custom log pedestal sink. Continuing on, a large great room opens before you to bring together the kitchen, dining and living areas. This social layout allows the whole group to be part of the action. The gourmet kitchen will satisfy the most discerning chef! Thick granite slab countertops, stainless steel Jenn Air cooktop, refrigerator, and Fisher & Paykel dishwasher drawers arm you with the best for entertaining a crowd. The other side of the great room is shared by a warm living room and open dining area. Windows abound with built in bench seats, as well as a cozy sofa and chair that surround the large flat panel TV and dvd player. This is the perfect gathering spot for movies or just socializing around the wood burning stove. Moving to the second story are 3 bedrooms, 2 full baths, and the laundry area. The master opens to vaulted ceilings and a wall of windows that bring the great outdoors right to you! A walk-in closet provides plenty of storage during your stay, and the custom en-suite master bathroom offers 2 vanities, a jetted jacuzzi tub and 5 head steam shower. The second bedroom upstairs showcases a queen bed, built-in log desk, sweeping views of Mt. Crested Butte and a private deck. The 3rd bedroom features a custom built bunk bed with a queen on the bottom and a twin on the top. Located in the prestigious Verzuh neighborhood, this quiet location is less than a 5 minute walk to Elk Ave shops, restaurants and the free mountain shuttle! Numerous trails, Rainbow Park, and the Center of the Arts are all within a short stroll of this fantastic property. No need for a car when staying in the town of Crested Butte! Master bath is en-suite with double vanities, tub and shower. Other two full bathrooms feature tub/shower combos. Great house with plenty of room. Well equipped and furnished. Very nice response from management regarding a few minor issues (we overheated the oven and requested a late checkout). Parking was a little difficult as the garage is small and the second spot outside the garage had 5 feet of snow. We just parked in front of the garage. Would definitely come back. First trip to Crested Butte and the very nice town is an easy walk from the house. I am happy to know that you enjoyed your stay at the Sopris House as well as, Crested Butte! I apologize for any confusion, but the there is not an additional parking spot in the back next to the garage that is for snow storage. The additional parking is in front of the house. We hope to have you back again soon! The Sopris house met all of our expectations. Beautifully built mountain home, Large, comfortable, lots of windows, quiet, close to mountain biking trails (you can ride right from house and be on trails quickly). all the beds were very comfortable, the bedding was excellent, all the bathroom towels were luxurious, the kitchen was very well equipped with good quality cookware, plates, silverware, glasses and enough for a large group. The living room has these great comfortable window seats to curl up in. the outside barbecue /grill worked great. We used the wood stove once and it worked very well. Property managers Alpine Getaways were just great to work with for the couple of small questions i had. Just a Top Notch house! Hi Carrie ~ Thank you for taking the time to tell us about your stay at the Sopris House! We are happy to hear that you loved it. Come back soon! Hi Jeff ~ Thank you for sharing your great experience staying at Karla's Cottage! We think it's one of our best properties for a small group getaway. We would love to have you return! Hi Julie ~ Thank you for taking the time to review your stay at the Sopris House. It is one of our favorites. I'll mention the internet speed to the homeowners. We've never had a complaint about it. Please let me know the next time you are visiting Crested Butte. We would love to have you stay with us again! Beautiful Home - perfect for celebrating our daughter's wedding. Family room was fantastic. Property is well appointed with design features emphasizing the Mountain setting. Kitchen was well stocked with pots, pans, etc. & pantry items. Family room is the focus for a comfortable family gathering with lots of seating available. Windows with views & window side cushioned seating was a favorite place for lounging. Each bedroom had its own personality & unique set up. Loaf provides extra sleeping - especially suited for children/teenagers to enjoy a slumber party setting. Memorable home setting for our wedding weekend. Hi Mike & Rebecca ~ Thank you for taking the time to leave such a great review! We love the Sopris House and find that our guests do too. Please let us know the next time you plan to visit Crested Butte. We'd love to have you back! Family gathering of 8 adults. The layout of the house was excellent for us- one bedroom downstairs with full bath, three bedrooms on the second floor with two baths, plenty of storage, fabulous great room for gathering, huge dining room table that seats ten, and a well laid out and stocked high end kitchen. The refrigerator is huge, and both the oven and gas cooktop were terrific. This house is in a quiet residential neighborhood. The walk to town is about a 10 minute stroll and the bike/dog path is one block away. All the beds were very comfy, and the showers were great. The large grill on the front porch worked well, and we were especially grateful to find such a large, gorgeous home that would allow us to vacation with our pooches. The property management is responsive and very professional. One note: The loft on the top floor has 4 small (twin) mattresses in two rooms, but the staircase up to them is extremely steep and the steps themselves are about 4 inches wide--possibly too tricky for young children. This is definitely a house we would return to . Thanks so much for taking the time to tell us about the joys of staying at the Sopris House. We hope to have you back the next time you visit Crested Butte!